Web-Server Review 2019: Is Web-Server a Good Hosting? With 15 years of experience, Hungarian host Web-Server provides fast, stable, and simple web hosting that the vendor hopes will translate into actual success for its customers. Web-Server is a privately-owned Hungarian company with an outstanding 15 years of online experience. Its ultimate aim is to provide fast, stable and straightforward services to small businesses and web developers using the latest technologies. Although its attractive website translates well enough into other languages (particularly) English, you might struggle if you don’t speak Hungarian. Web-Server’s web hosting packages are somewhat confusingly named ‘Storage’ packages. To make matters more confusing, the Hungarian phrase “TÁRHELY CSOMAGOK” (meaning “storage packages”) translates to English as “DISCONTINUED PACKAGES” in my web browser. Don’t despair! 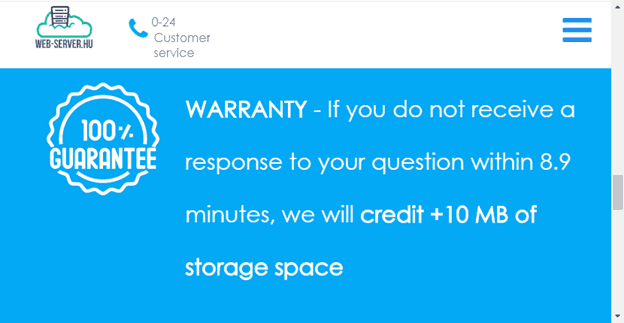 This hosting vendor is alive and well, and its hosting packages are available at the time of this review. 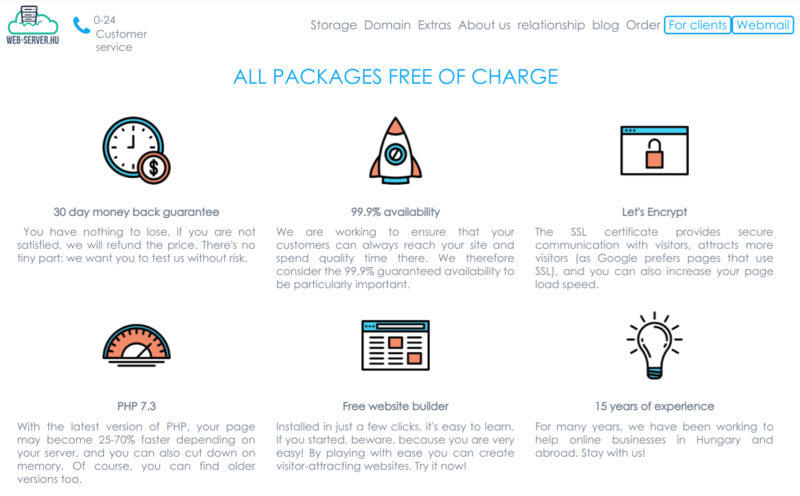 As long as you choose the M, L or XL storage package, Web-Server will provide you with an easy-to-use Website Builder with free templates to make your website-building job much easier. Web-Server’s hosting packages also support the usual CMS software such as WordPress, Joomla, and Drupal. If shared hosting is not for you, you can alternatively opt for a virtual server rental option that comes with Hungary’s biggest available bandwidth and with the Debian/Ubuntu operating system pre-installed. RAID storage and daily backups ensure the security of your data. Web Server offers five web hosting plans, three of which – M, L, and XL – are priced incredibly fairly compared with competitors. They come with a 30-day money-back guarantee policy, and you also get an eBook as a goodwill gesture, which will help you choose the right domain. When I went to check out, I discovered that a two-year commitment was 20% cheaper than what 2x the annual cost would be. Existing customers can log in, in Hungarian or English, presumably for additional support resources. And Web-Server also publishes an up-to-date blog with tutorials and handy hints on getting the most from this host. Web-Server has the potential to become an outstanding Hungarian web hosting company by offering high-quality easy-to-use hosting services. Wondering how Web-Server stacks up against other Web Hosting companies? Enter any other Web Hosting company and we will give you a side-by-side comparison.